It’s not that uncommon these days for households to have more than one Windows computer in them with desktops, laptops, ultrabooks, netbooks and even Surface devices a possibility. If you fit into the category of multiple PCs in your home, then it’s probably also the case that they will all be networked wired or wirelessly to a router so they can connect to the internet, and also together so files can be shared between each other. The problem with having different machines on the local area network is it’s not that easy to find all available shared files and folders, you would normally have to manually browse the shared folders to find what you’re looking for. Obviously Windows has a built-in search feature that scans your own computer for files, but it doesn’t automatically scan the network for anything. There are many dedicated search utilities around that give the opportunity to search local files and optionally a mapped network drive or single share folder, but they are require manually entering any shared resources. However, there are a couple of free tools around that are specifically designed to scan your local network for all shared computers and folders so you can see everything that’s shared on the network. This way you can search the the whole LAN in a similar way you would search your own computer. LAN Search Pro is by SoftPerfect and years ago used to be a $40 shareware, but is completely free these days. SoftPerfect are the people behind other excellent tools such as Network Scanner and NetWorx. It’s a powerful utility which is specifically designed to perform searches over a Local Area Network quickly and efficiently while being easy enough to use that it doesn’t confuse you with hundreds of options. LAN Search Pro is also able to scan and search hidden network resources, restricted access resources, IP subnets and LAN FTP servers among other things. 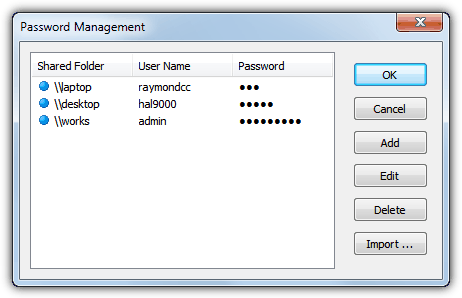 A useful feature is the built-in password manager which allows you to store the username and password login details for computers or shared folders that are protected. A list of computer logins can also be imported from a Comma Separated Value file (CSV) to make things easier for multiple entries. It’s also very easy to map and unmap network drives from the main window. Searching is the same as it would be in Windows, simply enter the search terms into the text box. Wildcards are fully supported so you can enter *.jpg or Myvid*.mp4 etc, and multiple terms can be entered on the line by separating with a semicolon. Once the search has completed and the files are displayed, standard Windows functions such as copy, move, delete, copy path, Properties and rename are accessible from the right click menu. There are several additional features including result sort and search, date and size filtering, exporting the results to CSV, HTML or XML file, include or exclude specific computers from the searching, and also include and exclude specific shared folders. You can also choose where to search for hidden folders and anonymous LAN FTP servers. 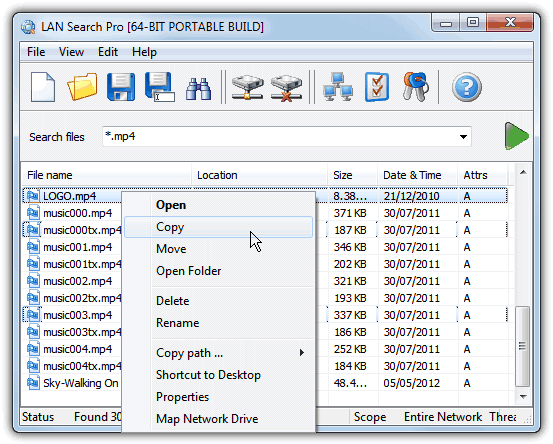 LAN Search Pro has installer and 32-bit/64-bit portable versions available, it’s also free for home or commercial use meaning it can also be used on business networks. LanHunt calls itself a LAN search engine and is a tool which can list and index all the files on the local network and store them in the program’s database. This differs from SoftPerfect LAN Search Pro because that tool searches the network in real time for the files, where LanHunt gathers the information beforehand and reads it from the database which is updated by you manually. While this should be quicker to search because it behaves like Windows indexing, it does mean you might not get the latest list of files available on the LAN if they have been added since the last index update. LanHunt is a Java based application so requires you have the Java Runtime Environment installed. The program interface works in a series of 3 steps which you go though to set everything up and get the file list off the LAN and into the database. Firstly you’ll be asked to enter the IP address range to search on the network, it’s best to keep this range as narrow as possible to speed up the indexing although the program does do parallel searching. The second step will begin scanning the given IP range on the network for the files, obviously the time it takes depends on the number of connected computers and shared folders/files available. The last step will take you to the main LanHunt window where you can start performing searches, simply type in the keyword and press Hunt to get the results. Wildcards or multiple search terms are not supported but the search will show all results that match the keyword, so for example, typing holiday will still show myholidaysnaps18.jpg and etc. There’s a handy drop down menu to filter executable files, video, music and documents. The search results will show in a new window which will display the location and filename of a match along with buttons to open the file, downloaded the file or open the folder location. You can also perform another search from the same window. LanHunt has quite a quirky interface which takes a little getting used to, but once that’s out of the way, it’s quite an efficient tool. Like LAN Search Pro, LanHunt is completely free for private and commercial use so can be used in small business networks which have Java installed as well as Home LANs. Search Everything is very good and fast search for desktop search. Another tool for searching LAN or shared drives is searchblox. Just install the windows exe version and index your local files. I am the developer of Lanhunt, just found your link on Google, and it feels good to read it. Thanks a lot. this is going to be a tool for me at school. Used this kind of software which enable me to scan and open shared folder/files but not with this much features! Great tips! Good tool to share! But very easy to misuse as well. I will recommend X1 desktop search if you want to search for particular email in outlook.